Back in 2016 when I first entered Europe and travelled overland from Iran, I found a lot of itineraries in Europe focused on getting the Eurail pass, a train ticket that lets you visit up to 28 European countries in a single trip. it was the most convenient way after all to visit a smorgasbord of European cities. I get why it is fascinating as a lot of movies tend to romanticize the train journeys in Europe for its stunning views and serendipitous occasions. Just like the movie ‘Before Sunrise’ where an American man meets a young French woman where they gallivant around Vienna with nothing but a backpack, a train ticket and loose plans. The idea of it sounds great and dream-like but it’s pretty easy to see why this touch-and-go experiences isn’t a match for me. Last summer, I booked a Flix bus ticket (20€) from Budapest to Ljubljana (pronounced Luu-bee-yana) over an 8 hour journey that would take me to the heart of the Slovenian capital. I was done with the European heatwave, flies and the Great Hungarian Plains and couldn’t hardly wait to spend time in the forested hillsides under the shadow of the Julian Alps. I spent close to two-weeks in Slovenia and slow-travelled as much as possible, giving up on nearby countries like Croatia a complete skip. I figured there’s always another time to come back and see it at the right time. But for many, I understand - two weeks can be long when all you’ve got are limited leave days. Hence, I have broken it down to a 7 day itinerary of what to see and the best places to visit in Slovenia. Slovenia is also known as the ‘Dragon City’. ﻿The lesser known destinations of Europe have a way of surprising you and making it easier to glide and traipse around towns at your own time, without feeling rushed. Ljubljana was just that; it was a whimsical, small town filled with dragon statues, artistic graffiti works and a stunning romantic river that could rival the one in Venice. The city is also known as the “dragon city’'. Legend has it that Jason and the Argonauts stole the Golden Fleece and slayed a dragon where the city stands today. The dragon symbol of the city represents strength and courage and can be found on top of the Dragon Bridge and at the castle’s tower on Ljubljana’s coat of arms. I highly recommend taking one of the free walking tours in the morning, so you can understand the sights and history of Ljubljana better. 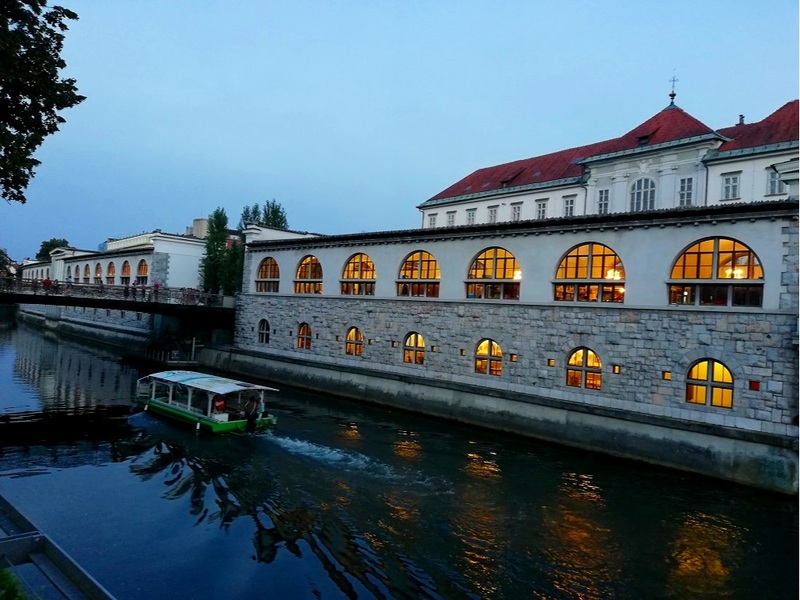 As you meander along the romantic Ljubljanica River, you’ll come across fruit stalls, little cafes and a trinket shops. Sit in one of these cafes to just take in the view and people watch. On both the river sides as you walk further in, you’ll come across the open market, palace, various cafes as well as the old town. The open market (open on Fridays) is a great place to try some Slovenian food even though it is slightly touristy. One of the best places to try the traditional Slovenian sausage is Klobasarna which is across the street from the main church. They serve it with mustard and sweet horseradish for a cool price of 7€ per person. At night, the city turns into a big party and promenade as couples and families take a walk down the streets wile musicians play at the Prešeren Square. During the day, there’s many wonderful distractions and places to see, while stopping to enjoy street performances and indulging in the local delicacies. Everything about the city oozed fairy-tales and wonder. Retrace back your steps and head over to the Metelkova City, to get an alternative vibe of Ljubljana. It is home to an alternative culture community with a sporadic mix of art galleries, LGBT spaces, and cultural spaces. Bustling bars and clubs around the area make it one of the most buzzing nightlife spots of the city. It was a former military barrack now converted to be the center of a quirky street where the young and cool of Slovenia hang out. If you’ve had a trippy end to your night after partying and dancing the night away in Metelkova, don’t fret about not catching the earliest bus to the picturesque Bled Jezero (Lake). There are hourly departures from Avtobusna postaja (bus station) which will cost you around 7€ making the ride to Lake Bled a breeze. One hour and 19 minutes is all it takes. On my bus ride, it was nice to connect with other travellers but it was such a shame to hear that Lake Bled is only a “short stop” for them before they head to Croatia, a rising top-rated destination which will soon be eroded with overtourism. One can’t imagine the magnificence and beauty of Lake Bled. If Disney’s princesses lived In Europe, I would imagine them to live in the tiny island in the middle of Lake Bled. On the island, there is the Church of the Assumption, dating back to the 17th century. It is almost medieval-like and straight out of the pages and movies of fairy-tales that I have grown up with. To visit the lake, you can rent a special boat with a roof, called pletna, and pay about 12€ or find your balance with stand-up paddle boarding which is what I did for 10€. The calm, blue water makes it easy to balance, soak in the sun and have your personal moment paddling around the lake. Take a boat ride to the little island in Slovenia. Once you’ve had your fair share of adventure, take a walk around the lake. It takes around two hours to walk around it. But this is no ordinary walk - it is a walk filled by nature and mountains, and hidden spots for you to camp and take your book out to read. To get to the viewpoint, there’s a Baroque church where couples come to express their love to their lucky one. The stone staircase with 99 steps is particularly famous in wedding rituals, and tradition says that it is good luck if a groom carries his bride up the 99 steps. A trip to the lake is not complete without hiking the Mala Osojnica. It is a one hour hike where you will be rewarded with one of the best views of Lake Bled, the island, castle and Karavanke mountain chain in the background. Also Read: Hiking in Europe: Why Slovenia Has The Best Day Hikes? Lake Kredna in Radovna Valley, the only man-made chalk lake. The immediate vicinity of Lake Bled includes the Triglav National Park which covers 4% of Slovenia, almost the entire area of Julian Alps. Not too far away from Lake Bled, you can rent a bicycle or a car and visit the Triglavski Narodni Park. It is a pristine wonderland, with a striking world of rocky mountains – the centrepiece of which is Mt Triglav (2864m), the country's highest peak – as well as river gorges, ravines, lakes, canyons, caves, rivers, waterfalls, forests and Alpine meadows. You can spend your time here in the rivers and see a whole level of emerald green rivers, a quiet time away from the bustling Lake Bled. It is nice to get away from the main tourist strip and seek out hidden gems in Slovenia. There are a number of holiday homes scattered across the Alpine valley making it quite a dream to stay in a little cottage at the foothills of Triglav mountain. Just swimming in a pool of chalk. Once you’ve settled down and found a spot, ease yourself into this amazing man-made lake located in Radovna valley that’s made entirely out of chalk. Yes, chalk! Lake Kreda has an intriguing history of how it became a recreational spot in this region. The lake got its name from the chalk (Slovene: kreda) that was mined in the area until 1985. The digging also created a basin, which gradually filled with water and the lake appeared. The mining ceased because it was unprofitable and due to conservation concerns (the area is within Triglav National Park), but the lake remained and is now occasionally used as a recreation site. It was nice to relax by the lake side, and dig chalk from the sides while indulging in the clear and calm summer hues. A 30 minute drive from Lake Bled, and you’ll arrive at Lake Bohinj, the largest permanent lake in Slovenia. The area is large covering 12km and takes roughly 4 hours to walk around Lake Bohinj. Many visitors after taking a look at Lake Bled will say they have never seen anything more beautiful than this, until they step away and visit Lake Bohinj. Twice the size, and thrice the beauty and splendour of Lake Bled, Lake Bohinj has a way of pulling you in to pause, take in the surroundings and spend time doing activities you really love. Take a book, relax and read by Lake Bohinj. Not a soul in sight. If you’re a beach-goer and have been used to swimming in a soup of salt, you might be a convert after swimming in a vast lake filled with clear water. As you enter Lake Bohinj, you’ll come across the a monument featuring four brave men. The four brave men from Bohinj were the first to climb to the summit of Mount Triglav as early as on 26 August 1778. These were the early days where Slovenes from Slovenia were then formally recognized as one of the Alpine nations, giving birth to a new generation of mountaineers and climbing enthusiasts. The best things to do in Lake Bohinj is to read, and spend endless hours breathing in the fresh Alpine air as you find a quiet spot to take in the surroundings. But if you’re like me and would like to go on a hike, then the best way is to hike to Slap Savica waterfall and Mostnica Gorge. They offer views of crystal clear pools and boldly water-shaped rocks, as well as diverse flora and fauna and a cultural landscape that has been nurtured by the people throughout the centuries. 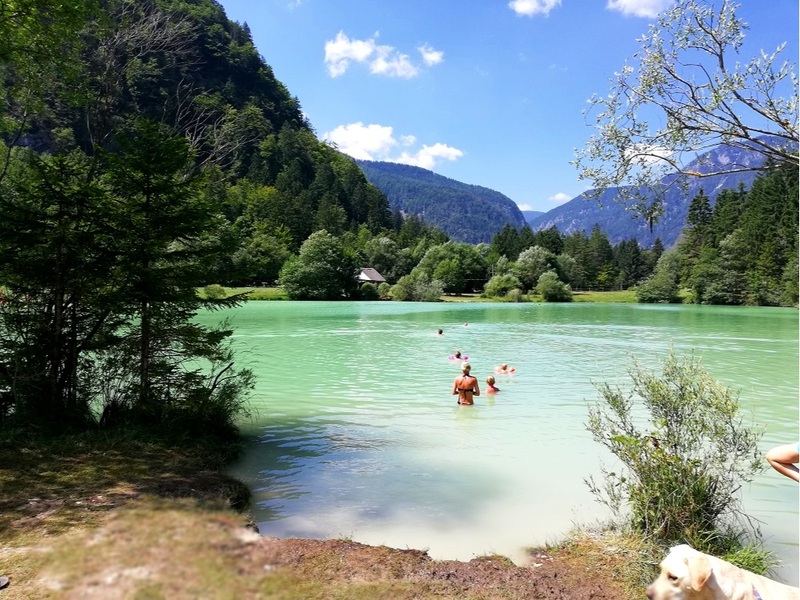 The fairytale regions of Slovenia such as Lake Bled and Lake Bohinj had shown me the natural beauty and surprising stories of what a green tourist destination could look like. 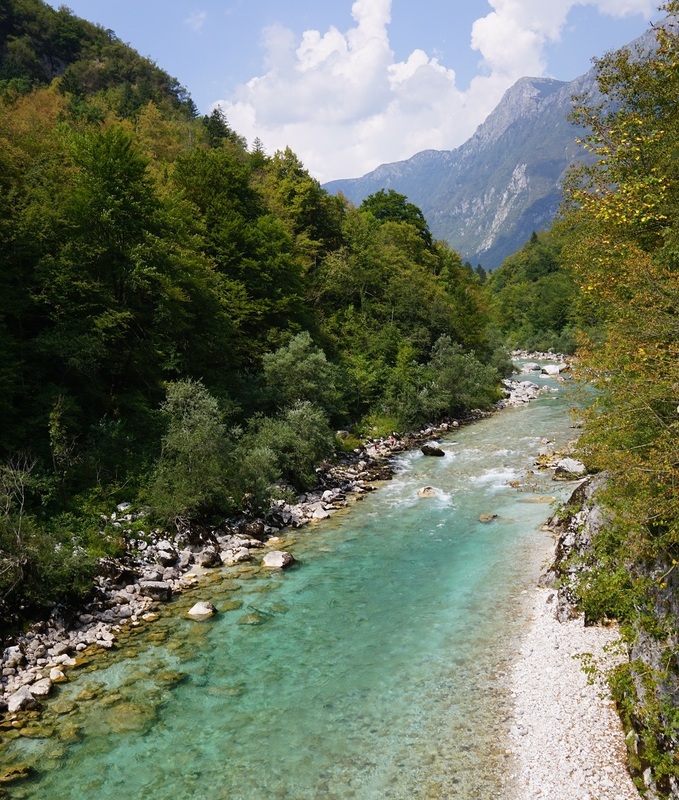 But that was not all to this Alpine region as I was about to visit a place with one of the most beautiful and best preserved Alpine rivers in Europe, the emerald green River Soča situated in Bovec region. I took a bus from Lake Bled to go to Kranjska Gora and from Kranjska Gora to Bovec with the bus company Nomadgo. The bus will take you over the Vrsic Pass to visit the Bovec region, the adventure capital of Slovenia. The buses over the Vrsic pass only operate during the summer months, until the end of August and it is hard to visit this place during other seasons of the year. On your bus ride up the Vršič Pass, your bus driver may stop at the pass after climbing some 25 hairpin bends. Each hairpin bend is numbered and shows its elevation, so you know where you are. I saw dirt-covered hikers who had just finished their hiking trips and used the bus to travel to the next immediate town. So what can I tell you about Bovec? On your arrival, there are very few accommodation options in Bovec and some of the best places to stay are Hostel Soca Rocks, Thirsty River and Hotel Mangart. It was hard for me to get an accommodation and I was lucky to be hosted by a CS Slovenian couple who had a temporary home in the city square on the same building as Mercator supermarket. You can spend the day walking around the town and the main square where they often hosts nightly gatherings and street parties. Spend your evenings at the Gouf bar, where you can savour some of their coffees and hamburgers. The Chronicles of Narnia comes alive in the Upper Soca Valley region, in Slovenia. ﻿For starters, it’s the prettiest place on earth teeming with local life, mountains and green rivers straight out of the movie Chronicles of Narnia and to a close second the Avatar movie set. It is the kind of place where international hotels are nowhere to be seen, only local family houses with “farm to table” concepts and homestays scattered throughout the Alpine region. Once used to film The Chronicles of Narnia (Prince Caspian edition), the green valley has a long list of natural wonders, from the Boka waterfall (the country’s tallest) to the Triglav National Park, Great Soca Gorge, and snow-capped Julian Alps, a Unesco biosphere heritage site. In summers, the water is icy cold and is a cool 8-degree temperature that is somewhat mild compared to other seasons of the year. Cliff-diving is the best way to experience the cool Soca river. I was fearful at first because the waters looked really deep but I figured it is better to jump in a pool of clear water than a salty one. 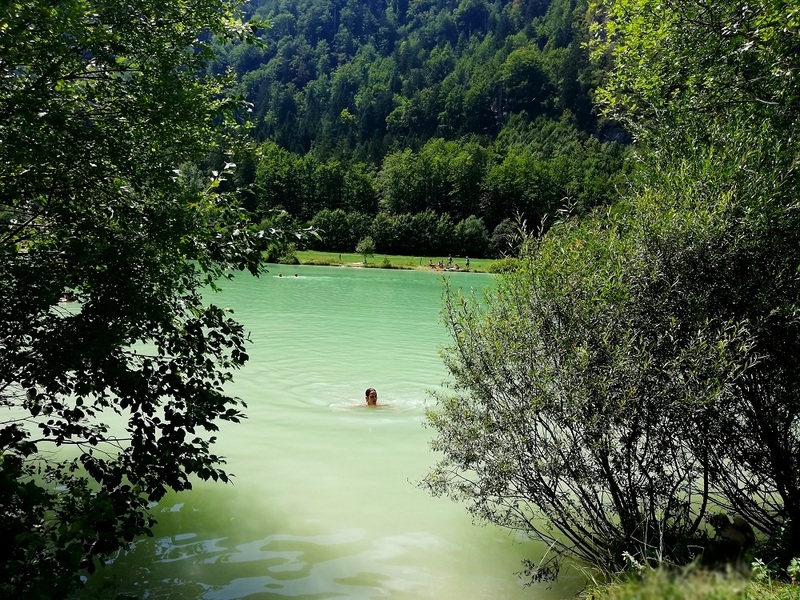 I imagined poets jumping in the Soca river to get inspiration for their next drafts, as one dip was enough to reinvigorate my senses and reflect on the artistic pursuits that I had left halfway through my life. Was it art, or my constant doodling in school? I felt a sudden urge to just pick up some pencils and start sketching. If you thought Bovec was quaint, Kobarid, a settlement in the Upper Soca Valley region is quainter and has a Mediterranean feel to it compared to the other Alpine regions in Slovenia. It is along the Italian border and shared an interesting part of history running across the Soca Valley. In World War One, this was the infamous Isonzo Front and it was even home to an award-winning regional museum about the battles in these mountains and a major point on the Walk of Peace trail along this former front. Various archaeological sites testify to the rich life and strategic importance of Kobarid in ancient times. 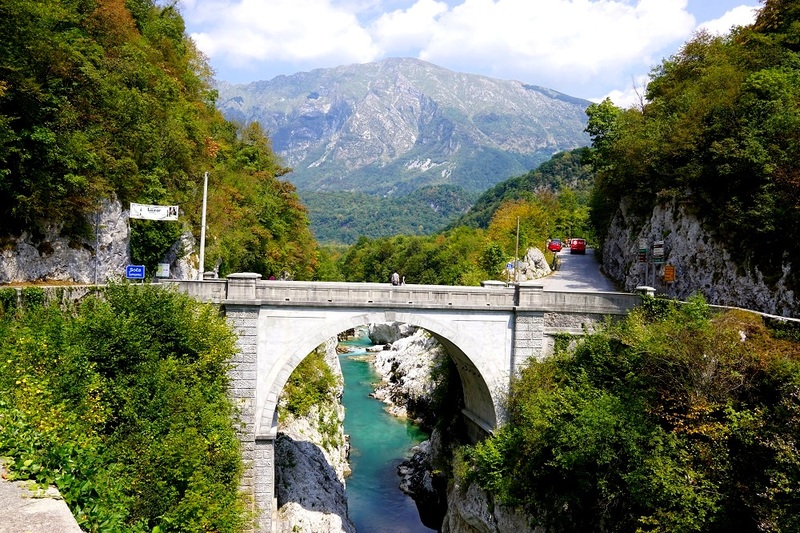 Near Kobarid, the banks of river Soča are connected by the impressive one-arch, stone-made Napoleon Bridge, built in 1750. It was blown up by the Austrians in WW1, after which the Italians built the existing bridge. Believe it or not, these were crampons used by the Italian Soldiers during the war. A pictorial journey of the war at the First World War museum in Kobarid. It’s hard to believe given the peaceful surroundings, that this was a valley where a bloody war (the Battles of Isonzo War) took place between Italy and the Austro-Hungarian empire, resulting in 300,000 soldiers losing their lives. The impressive Kobarid Museum and the First World War museums along the Walk of Peace, a mountain trail that runs along the Alps to the Adriatic is definitely worth a visit. On your last day, you can get a bus in the evening or the next day from Bovec back to Ljubljana. This is your last day so don’t forget to try the local Burek, a Balkan pastry of Turkish origin, and savour that last wine or the best of all, your last Soča river dip. This should be the perfect itinerary for your stay in Slovenia. Insider Tips: How To Travel Around Slovenia? Italy and Austria were not too far away from Slovenia. Car Sharing: A really cool option is the local car sharing site like BlaBlaCar called Prevozi. It costs at most about 4 to 5 euros to go to most places and most locals even use it. Car Rental or Driving in Slovenia: If you’d like to rent your own car, I have read that most people have rented their car from ATET. This is the best starting ground for a road trip across Slovenia. Cycling / Bike Rental: I found this really cool guide over here on the Slovenia website with complete information on bike-friendly hotels, routes, trip highlights and everything. I wish I found this earlier because I would’ve probably taken a short bike trip in Slovenia. Also, if you really want to experience a short cycling trip, try cycling through the Radovna Valley, a stone throw from Lake Bled where you can finish or stop in a tourist farm Psnak to enjoy a cold drink and the views of the high mountain. Do not cycle in Lake Bled because the path simply isn’t suitable since there are so many people. English, a problem? You’ll find that all these sites are in Slovenian. You just need to right click, hit “translate to English” to use it and you’ll be fine. What about you? Which part of Slovenia are you most excited to visit? Tell me in the comments below!